Answer: If it wasn’t moving, and if it was fairly bright, and especially if it was low in the sky, what you saw was probably just a normal star doing its normal thing — twinkling (aka scintillation). 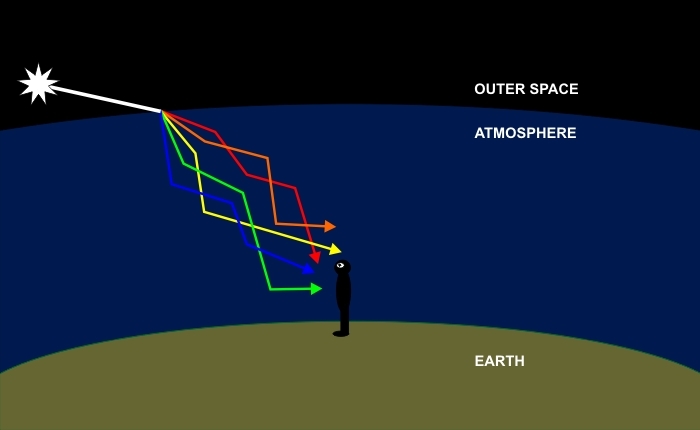 When light from a star enters Earth’s atmosphere, three optical effects occur. First, the light undergoes dispersion, the separation of spectral colors. As you probably know, normal “white” light is a mixture of all colors. These colors travel at identical speeds in the vacuum of space. But each color has a slightly different speed in air, which is what separates them. A similar thing happens when light passes through a prism, or a water droplet (as in a rainbow). Second, the light changes direction. It’s another optical effect called refraction, and it’s closely related to dispersion. Violet-blue changes the most, red the least. This occurs at the instant light passes from the vacuum of space into our atmosphere, where its speed is reduced by about 0.03%. Third, on their way to your eyes, the different colored light rays are subjected to atmospheric turbulence. This causes them to change direction many more times. Sometimes the rays hit your eyes, sometimes they miss. It’s a dynamic effect that you observe as twinkling. The graphic above exaggerates the effect. What it looks like through a scope is shown below. This video features Sirius, the brightest star star in the sky, magnified about 200 times. Sirius was near the horizon, where twinkling is enhanced by thicker air lower in the atmosphere. This 5-second video will continue to loop automatically, and shows what is intrinsically a blue-white star flashing red, violet, and (if you watch closely) also some green and orange. Those colors are dispersion working its magic. All stars twinkle, but the effect is most pronounced with brighter stars when they’re near the horizon. Next time you recite the classic poem Twinkle Twinkle Little Star, consider that this poem was written right around the same time the physics of dispersion was being sorted out. Jane Taylor wrote that poem in the late 18th Century.